English teacher, journalist and long-term Moscow resident Stephen Wilson has teamed up with a group of Russians to set up a volunteer organization to help displaced citizens from eastern Ukraine to find work and accommodation in the Russian capital. RBTH found out more. As the conflict in the southeast of Ukraine continues to rage, many citizens from the war-torn area are continuing to flee to neighboring Russian regions, where they hope to find a job and accommodation. While Russian migration officials are facilitating procedures, dozens of volunteer organizations have emerged to help displaced people. 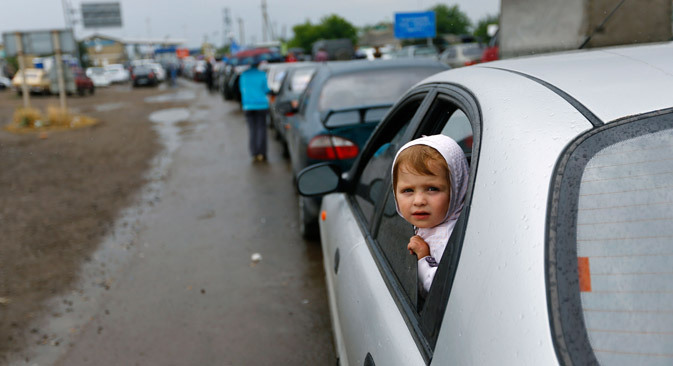 Along with the Rostov Region and Crimea, Moscow is also seeing an influx of refugees. The Russian capital has attraction of having the biggest network of non-government and volunteer organizations that support the thousands of people escaping the war in eastern Ukraine. Stephen Wilson, 53, a Scotsman who has lived in Moscow for the last 20 years with his Russian wife and a family, could be called a volunteer without borders. Wilson teaches English as a foreign language but also does some journalism to support a radical trade union newspaper in the United States. Together with a group of four Russian human rights activists, he has set up a volunteering organization that focuses not only on donations but also on mentorship and psychological support for the distressed refugees. “We don't have posh offices or any paid secretaries or bureaucratic structures,” Wilson said, adding that they provide some clothes, toys for children, diapers, soap, toothpaste etc. “What we quickly discovered is that the refugees want help with applying for refugee status, getting work and of course, a place to stay if they are not at a dacha or hostel. “What I think we really need to offer refugees is moral and spiritual support and be generous with our time. So I think it is important to offer them friendship. Some of the volunteers are Orthodox and hence we pray for them,” said Wilson. According to the Scotsman, even if a volunteer has no resources he might be able to play with children or teach them something useful, making the organization labor-intensive as opposed to capital intensive (i.e. simply putting money into a bank account). “We are working on the idea of one volunteer being assigned to help the needs of one family while another volunteer would take some responsibility for another,” Wilson told RBTH. The idea is similar to the one promoted by Big Brothers Big Sisters, an international mentoring program for children in need that has successfully provided friendship to children all over the globe since 1904. Wilson said that the influx of refugees to Crimea, Rostov-on-Don and Moscow has created real chaos with documents and work permits for the newcomers. “The Migration Service can't completely manage all the applications in Moscow, so they are encouraging refugees to move to other regions in Russia outside Moscow,” he said. “Some refugees are currently being refused registration by some local officials and are being told they can't work without propiska (registration). There is a lot of disorder that needs to be resolved,” Wilson said, adding that his organization is working hard to settle these issues.